"Dr. Shifflett is the best!" Handpicked by Dr. Robert S. Bray Jr. to join DISC Sports & Spine Center, fellowship-trained orthopedic spinal surgeon, Grant D. Shifflett, MD, takes a patient-centered approach to care at his offices in Marina del Rey and Newport Beach, California. With vast experience in minimally invasive and complex reconstructive spinal surgeries, Dr. Shifflett strives to restore each patient's functionality and quality of life. Using cutting-edge techniques, he takes an evidence-based approach to treat patients with a variety of spinal conditions, including scoliosis, stenosis, disc herniation, and degenerative disc disease. Whether Dr. Shifflett provides non-operative care such as stem cell injections or performs innovative procedures such as artificial disc replacement, he does so with compassionate care and understanding. Dr. Shifflett received a bachelor’s degree in neuroscience from the University of Virginia before graduating with the highest distinction from the University of Southern California Keck School of Medicine. He completed an internship and residency at the Hospital for Special Surgery, affiliated with New York - Presbyterian Healthcare System and Weill Cornell Medical College. After venturing on a traveling fellowship to Japan, Dr. Shifflett returned to the United States and completed a minimally invasive and complex spinal surgery fellowship at Rush University. There, he learned microsurgical techniques, focusing on outpatient, fusion, and non-fusion procedures for the cervical, thoracic, and lumbar spine. 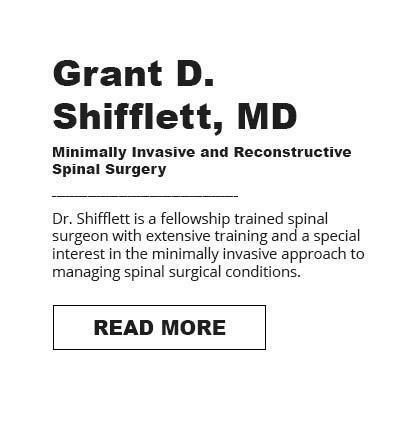 Highly recognized in the field of spinal surgery, Dr. Shifflett has presented at numerous conferences, written multiple medical journal articles, and received a variety of grants and awards for cutting-edge research and clinical studies. Hi, I am Blake Richard the Practice Manager for Dr. Shifflett. I plan, coordinate, direct and supervise all practice operations. My role is to ensure the provision and development of high-quality patient service. I have been a competitive athlete for years participating in football, ultra trail running, and tri-athlons at the highest level. Having this background I know what it takes to be at the top and it is my job to ensure all of our patients reach and return to their best. I have years of experience in the medical field and ultimately, I am here to serve you. Feel free to contact me with any questions that you have, I pride myself on being available 24/7. "I approach every patient as though they were a family member. I want to understand your concerns, your goals, what's important to you, and ultimately work with you to develop a plan to get you back on your feet." Dr. Shifflett is a participating provider with Medicare and accepts most common health insurance plans. The following are just some of the plans we accept. If you have any questions about your coverage, please call our office and a member of our staff would be happy to confirm coverage for you. "Outstanding Dr. excellent bedside manner, very clear communication. Highly recommended"